6pm, Tuesday, May 4th, 2010, at Culture At Work, 6-8 Scott Street, Pyrmont. Dr Adam Hamlin will present a lecture on the latest research into Alzheimer's disease. My embroideries will be on display in the gallery. Put the date in your diary now and keep reading the blog or checking the website for more details as the time comes nearer. 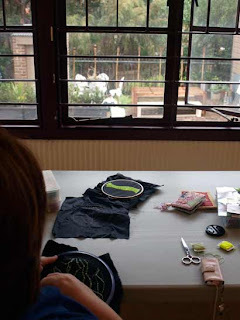 Sherryl took this picture of me yesterday, stitching in the studio at 6 Scott Street. It's such a lovely space to sit and sew, even on a drizzly day!